Sakis Gouzonis self-produced and self-released his sixth studio album last month. While listening to his new album you will enter into an unimaginably beautiful music world. Spiritual Unity features amazing original music that has everything you need to energize yourself, feel alive and get inspired. The dreamy tracks of the album can actually lift you off your feet and into a much higher realm. The Greek musician is a superb composer, excellent orchestrator and magnificent producer of electronic music. He knows exactly what his fans want, and he gives it to them in generous measure. In return, his fans live, eat and breathe everything that is Sakis Gouzonis. “I make music because I like to spread happiness to people of all ages and cultures,” Sakis Gouzonis says. Tracks include: Every Time We Talk, Joy Of My Heart, Happy, When We Are Together, Give Me All Your Love Tonight, Hand In Hand, Love Of My Life, For An Eternity, Wonderful Mystery, Now And Forever. Sakis Gouzonis was born in Thessaloniki, Greece. His career took off when he entered the international Composition Competition 2007, winning third prize and a commendation award for two tracks from his first studio album First Contact. Up to now, Sakis has released six full-length albums, has won a total of ten international music awards/distinctions, and has gained more than 450,000 registered listeners in 220 countries/territories. What makes this all the more impressive is that it has all been done independently, with no record labels, management/booking agencies or marketing companies involved in supporting him. 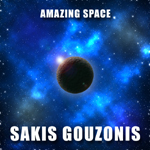 Sakis Gouzonis’s new album is available for free download at https://www.sakisgouzonis.com. 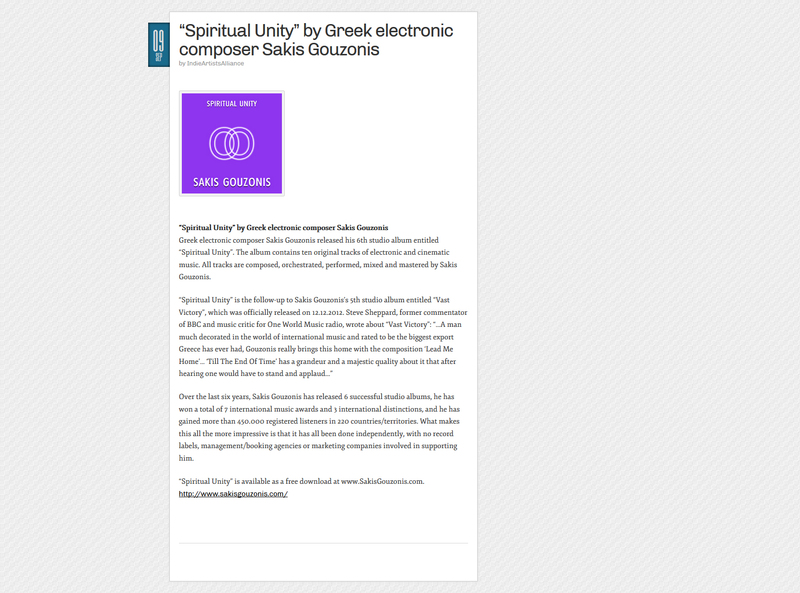 “Spiritual Unity,” the highly anticipated new album by award-winning composer and producer of electronic music Sakis Gouzonis, features ten new original tracks. The arrangements are masterful, the compositions grand and the performances confident and inspired. The Greek composer knows exactly what his fans need, and he gives it to them with a lavish hand. Since 2008, he has captivated audiences from concert halls, to schools, to churches in Greece and Europe. He is a prolific composer and the recipient of numerous international music awards. His music has been heard on radio and television and his many recordings have been recommended by Highwire Daze e-magazine, IMRadio, Blazing Minds blog, Cross Rhythms media ministry, AltSounds music community, Broadway World portal, CountryHome e-magazine and many other media outlets around the world. Being the most successful independent artist in Greece, Sakis Gouzonis has also been featured on some of the biggest Greek newspapers, blogs, e-magazines and portals, such as Eleftheria newspaper, Imerisios Kirikas newspaper, Eparhiakos Logos newspaper, Zougla blog, Tro-ma-ktiko blog, Tralala portal and Mic portal. You can listen to and download “Spiritual Unity” for free at www.sakisgouzonis.com. Sakis Gouzonis is currently impressing electronic fans with his latest album “Spiritual Unity.” “Spiritual Unity” is a masterfully crafted album. From the opening track till the very last, superb and of highest quality melodies bring you hope, joy, love and encouragement. With the release of this album, Sakis re-defines the electronic music genre and sets the standard very high not only for electronic music, but for music as a whole. After six years in the international music scene, the famous Greek electronic composer has perfected his craft of music composition and production so that he pulls in all who stumble upon his music. For anyone that hasn’t listened to “Spiritual Unity” yet, prepare to fall in love with this album. It is available as a free download at https://www.sakisgouzonis.com. Enjoy. Whenever the name Sakis Gouzonis is mentioned to an electronic music composer, electronic music fan or anyone seriously into music, their response is always one of awe and reverence at the man’s unparalleled dexterity and creativity on electronic music. The Greek musician and composer released his first album in 2008, and since then has carved a reputation as one of the most innovative and leading electronic composers. He has the ability to make his synthesizer sound like an entire band as he takes his audience on a mesmerizing musical journey. On August 13, 2013, Sakis Gouzonis released his sixth album under the title “Spiritual Unity.” There is a sense of something both playful and serious in his new album, an unparalleled sense of freedom in his new compositions and orchestrations. Lovely, dreamy, touching, jaw-dropping and tasteful, this is music from a synth star on a planet all his own. 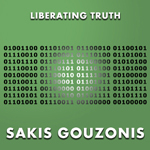 Indeed, Sakis Gouzonis’s music is the way the synthesizer would want to sound if it played itself. “Spiritual Unity” and all his previous releases are now available for free download at www.SakisGouzonis.com. On August 13, 2013, the Greek composer released his sixth album under the title “Spiritual Unity.” The new full-length album features ten electronic tracks full of emotions, power and amazing melodies that fill the place with positive energy. All tracks were composed and produced by Sakis himself in his recording studio located at the foot of Mount Olympus. The musicianship on “Spiritual Unity” is outstanding, ranging from modern synth chords to gorgeous string orchestrations. Clear melodic lines are a key feature of this album. It is with these strands, interwoven with intelligent and impressive beats that Sakis Gouzonis creates his magic carpet on which you are carried aloft to distant lands. “Spiritual Unity” is exactly what you would play to somebody who wants to be initiated into electronic music. Sakis Gouzonis was born in Thessaloniki, Greece, in 1978. He began composing music at a very young age, and released two compilations of hymn arrangements while still at school. His career took off when he entered the international Composition Competition 2007, winning third prize and a commendation award for two tracks from his debut album “First Contact.” Since then, without having any assistance from record labels, he has released six albums, has won a total of 10 international music awards/distinctions, and has gained more than 450,000 registered listeners in 220 countries/territories. Visit www.SakisGouzonis.com to listen to and download “Spiritual Unity” for free. 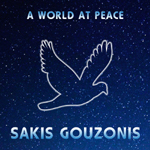 SakisGouzonis.com is very pleased to announce the release of Sakis Gouzonis’s 6th studio album entitled “Spiritual Unity”. The album contains ten original tracks of electronic and cinematic music. All tracks are composed, orchestrated, performed, mixed and mastered by Sakis Gouzonis. “Spiritual Unity” is available in MP3 format at www.SakisGouzonis.com. 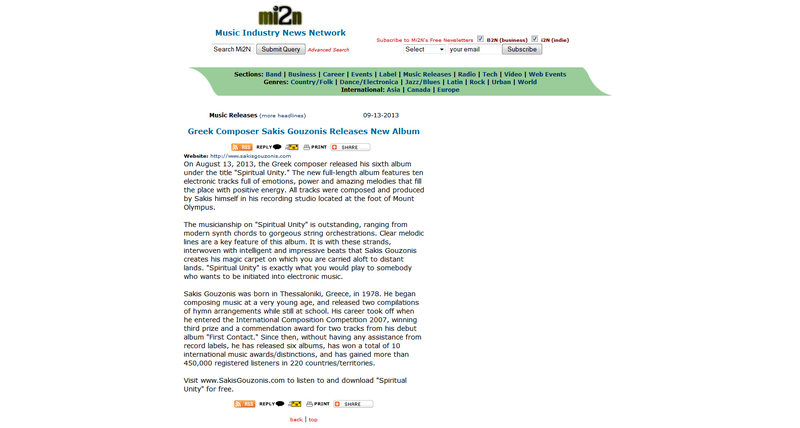 Greek electronic composer Sakis Gouzonis released his 6th studio album entitled “Spiritual Unity”. The album contains ten original tracks of electronic and cinematic music. All tracks are composed, orchestrated, performed, mixed and mastered by Sakis Gouzonis. Over the last six years, Sakis Gouzonis has released 6 successful studio albums, he has won a total of 7 international music awards and 3 international distinctions, and he has gained more than 450,000 registered listeners in 220 countries/territories. What makes this all the more impressive is that it has all been done independently, with no record labels, management/booking agencies or marketing companies involved in supporting him. “Spiritual Unity” is available as a free download at www.SakisGouzonis.com. Sakis Gouzonis is a Greek composer, orchestrator, arranger, producer, and performer of electronic music. He has released 5 studio albums so far. Over the last five years, and without the support of any record label, management/booking agency or marketing company, Sakis has won 7 international music awards and 3 international distinctions, and his music has gained more than 430,000 listeners in 220 countries/territories (not counting unregistered listeners). 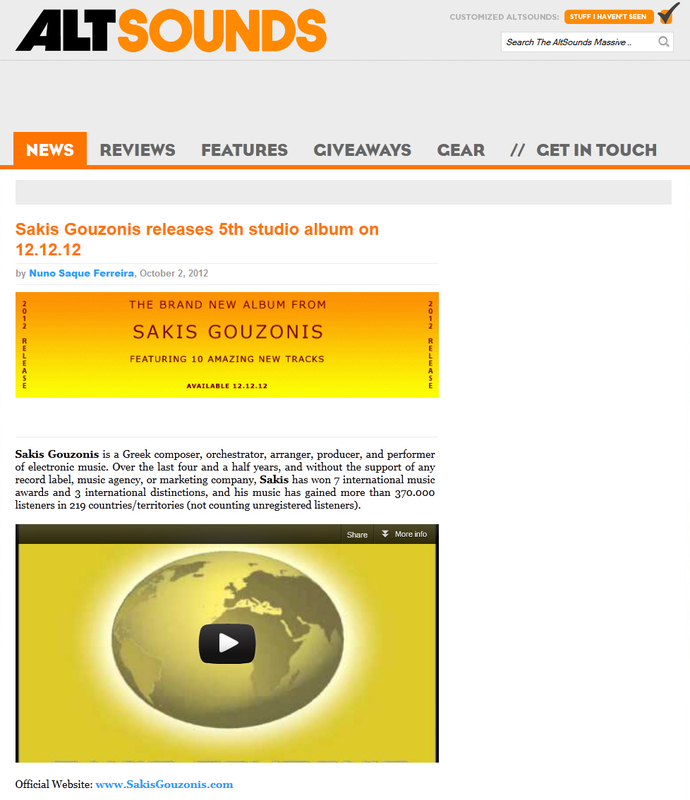 Sakis Gouzonis’s 6th studio album will be released on 13 August 2013, and it will be available through his official website at www.SakisGouzonis.com. 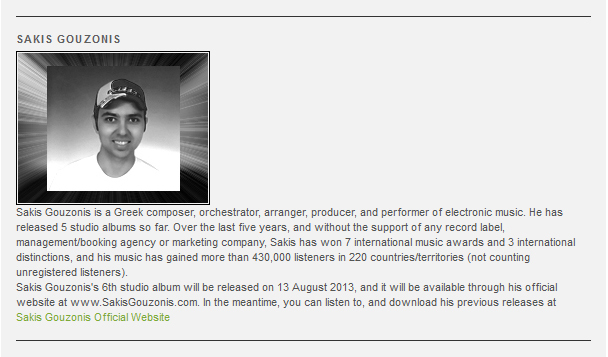 In the meantime, you can listen to, and download his previous releases at Sakis Gouzonis Official Website. Sakis Gouzonis is a Greek composer, orchestrator, arranger, producer, and performer of electronic music. Over the last four and a half years, and without the support of any record label, music agency, or marketing company, Sakis has won 7 international music awards and 3 international distinctions, and his music has gained more than 370,000 listeners in 219 countries/territories (not counting unregistered listeners).